With a number of my coursework deadlines in being in March, Iâ€™ve been very busy recently and spending a lot of time in the University library. It has three floors, lots of computers, printing facilities, and even a small cafe. If youâ€™re thinking of coming to study at Plymouth, hereâ€™s everything you need to know to get the most out of using the library. Whatever your library needs, thereâ€™s a section thatâ€™s got you covered. Around the thousands of books, thereâ€™s tables for groups, rooms for quiet study, and areas for other requirements like laminating, copying and guillotining. Once youâ€™ve found your ideal study spot, youâ€™ll get to know when itâ€™s likely to be busy. Luckily, our library is open 24 hours a day, 365 days a year! So, if you need to do some emergency printing late at night, or some last-minute revision first thing in the morning, rest assured that your needs will be met. The library has many bookable study rooms, some on each of the three floors. These can be really helpful in a range of situations. If you need somewhere quiet to study on your own with no distractions, there are small rooms for one or two occupants. If you prefer to study in a group, there are rooms for 4. There is also a room for 8, and for 12 people, which is a great place to go to prepare for presentations as a group. All you need to book a room is your student card which youâ€™ll be issued after starting university. This is a modern library for the modern student. It understands the importance of computer access, which is why there are hundreds of computers available throughout the library, including PCs and Macs. There is university Wi-Fi throughout, and should you wish to bring your own laptop or tablet, there are hundreds of electrical outlets for charging your devices. Youâ€™ll also be able to print from your own laptops to the universityâ€™s fancy printers (they can even staple your pages together automatically!). Hopefully this will have given you an idea of what to expect from our library at the University of Plymouth. Youâ€™ll likely spend many a long day in there studying hard, but remember to take a break every once in a while. There are vending machines for snacks and drinks when you need them! 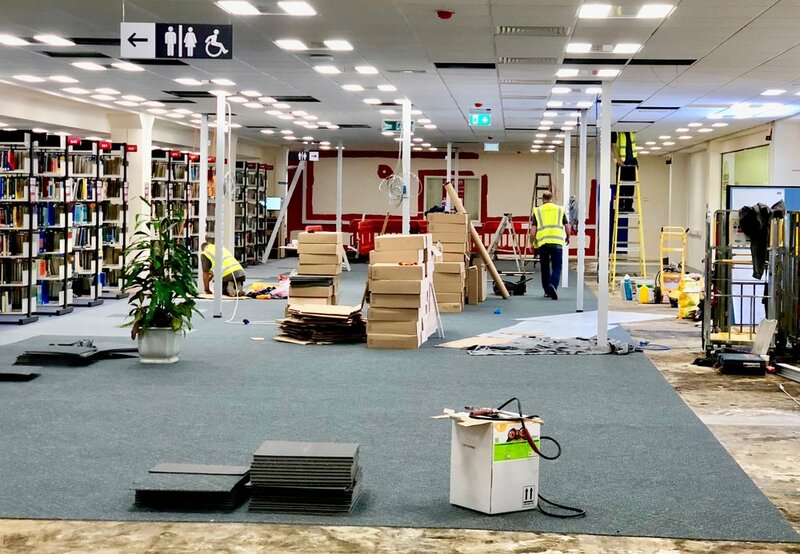 The first floor is about to undergo a refurbishment, so it will be exciting to see what our redesigned study area looks like as it develops over the coming weeks. It goes to show that the library is well maintained and kept up-to-date, so it meets the needs of the university students.